My mother passed away in 2004 at the age of 84. She never owned a computer and the age of social networks exploded after she passed. She was a child of a much earlier paper driven age. As an avid collector of recipes . I think she would have found the resources for a cook on the internet astonishing. She would have had access to resources that were endless and as in her words “diverse as all get out”. There would be an immediate connection to the minds and souls of cooks world wide, and if she needed an odd ingredient that she couldn’t locate at her local ShopRite, she could have gotten it from Amazon or a dozen other web sites, and had it delivered right to her door (which she would have told me was a rehash of the mail order catalogs of her youth!). I still have one of those notebooks. Its stained and the covers are long gone. 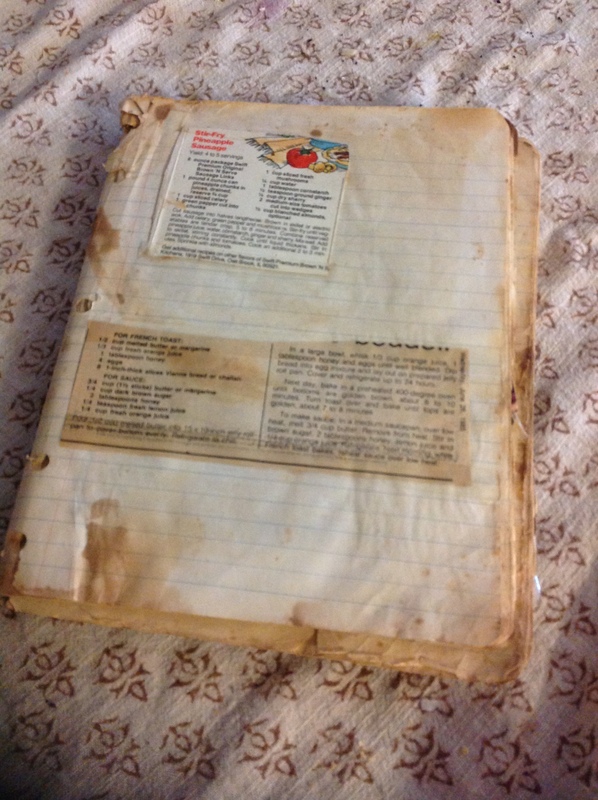 But inside are all those recipes she saved, and some she even wrote down in her perfect handwriting. Its a personal account of her thoughts and cooking perspective as well as the times (which appear to cover the late 70s through the 80s). Its a physical Pintrest that you can hold in your hand, and see the mind and soul of a cook.